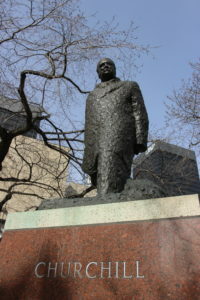 Purchased for $125,000 and gifted to the City of Edmonton by the Sir Winston Churchill Society in 1989, this firm and active pose of Churchill represents his unflagging leadership in times of hardship and war. Sculptor Oscar Nemon met Churchill in Marrakesh in 1951 and developed a deep friendship with him. He created the sculpture for Elizabeth II at Windsor. Dramatically composed, Nemon’s sculptures show how he seized momentary impressions to meld the boundaries of portraiture, creating pieces that are, at once, intensely true to the subject but also explore and question who they are. Until his death, Oscar Nemon was the sculptor to the British Royal Family. A spectacular list of high-profile figures sat for him, including Queen Elizabeth II, D. D. Eisenhower, Charles Lindbergh, Sigmund Freud, and Margaret Thatcher. Biography: Oscar Nemon (née Neumann) was born into a close Jewish family in Osijek (now Croatia) in 1906. The second of three children, he displayed an advanced talent for drawing that became enhanced by his father’s death – the tragedy fired him with a sense of urgency and an awareness of mortality. From age 14 onwards, these feelings found expression in the sculptures and portraits which he first exhibited in 1923 and 1924. After being mentored by pre-eminent sculptor Ivan Mestrovic, Nemon moved to Vienna where he set up a studio and sculpted portraits and medals that he casted thanks to an uncle who owned a bronze foundry. From Vienna, Nemon travelled to Bruxelles where he studied at the Academie Royale des Beaux Arts and continued to establish his reputation, changing his name to Nemon. Portraits of Freud and Henri Spaak, the Belgian statesman, were exhibited in Nemon’s first substantial one-man show at the Palais des Beaux Arts in Bruxelles in 1932. The next several years were highly successful for Nemon as he was commissioned by King Albert I and Queen Astride of the Belgians. The rise of fascism, however, made it impossible for Nemon to remain in mainland Europe, so he moved to England in 1938. It was here where he met his wife, started a family, and established a studio. News that his family including his mother, brother, and grandmother had died in Auschwitz devastated Nemon. A sense of acute loss, combined with the burden of having survived, led him to question his right to create more personal and experimental works. He focused his attention instead on exploring and memorializing the human figure through his portraiture. Alongside his well-known artwork, Nemon created secret, creative pieces expressed in the later 1940s and 1950s in the sequence of coloured, lyrical reliefs which look back to the landscapes and mood of the pre-war Croatian coast. Nemon also continued to sketch and model figurative compositions such as Humanity, a memorial to the victims of the Holocaust in Osijek, and Per Ardua ad Astram, the Canadian Air Force memorial in Toronto. The last in this sequence, a pyramid-shaped composition titled Eternity, questions the relationship between life and art. Created in the final years of the sculptor’s life, it is situated in the garden of his studio on Boars Hill, near Oxford, where Nemon continued to work until his own death in 1985.